The versapulse line of lasers is now appears to be owned by Lumenis, but the manual I got with the laser clearly says this laser was made by coherent. In any case, this is a 20W model (there are also 10w and 15w models called the 1000 and 1500 respectively noted in the manual), which is capable of 2J shots at 10Hz. The laser head and power supply are downright massive compared to my eclipse laser system, but this system also puts out twice the power, and uses older technology. Unfortunately, I managed snap the original Ho:YAG rod, so I have since retrofitted it with a Nd:YAG rod, although I now have a smaller head that I use when I need 1064nm light so this laser has mostly been mothballed. A shot of the overall laser head, and a drawing I made of it in SolidWorks (see the more information section for the model). A view of the laser brick after it was disassembled, and a mockup of it without the cavity reflectors. The two flashlamps (top/bottom) can clearly be seen, along with the Ho:YAG rod (which is lime green), along with the flow tubes and the support structure. The cooling water is piped into the 6 large holes in the nylon rod holders, and it is forced through the flowtubes to coll the rod/tubes. Additionally reflector itself is cooled through 4 channels cut through its sides, and the space between the reflector/flowtubes, as well as the space between the ends of the rod and the mirrors, is in a separate cooling loop that was cooled with some liquid (I do not know what). A shot of one of the mirror mounts, and the removable mirror assembly that slips in. A shot of the flashlamps, and the holders. These were originally gold plated, but it looks like at some point the laser was run without proper DI water, and the gold was stripped off. This made them more or less useless (because the underlying copper is readily corroded by DI water), so an alternate method of mounting the flashlamps was ultimately devised using silicone and a lot of hackery (the main reason this laser was mothballed). Let this be a lesson to you all, don't ever run your wet-electrode lasers without proper DI water! 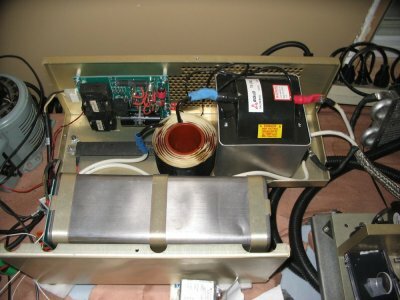 This attenuator was mounted in front of the aiming HeNe laser, and consists of a LCD panel which can be used to vary the laser output power from .1-5mw. A shot of the beam table and fiber coupler. Going from left to right, the beam table has a power pickoff (gold triangular assembly, that has provisions to measure both transmitted/reflected power) beam block (water cooled gray mass), beam shutters, and HeNe combining optic (green colored). 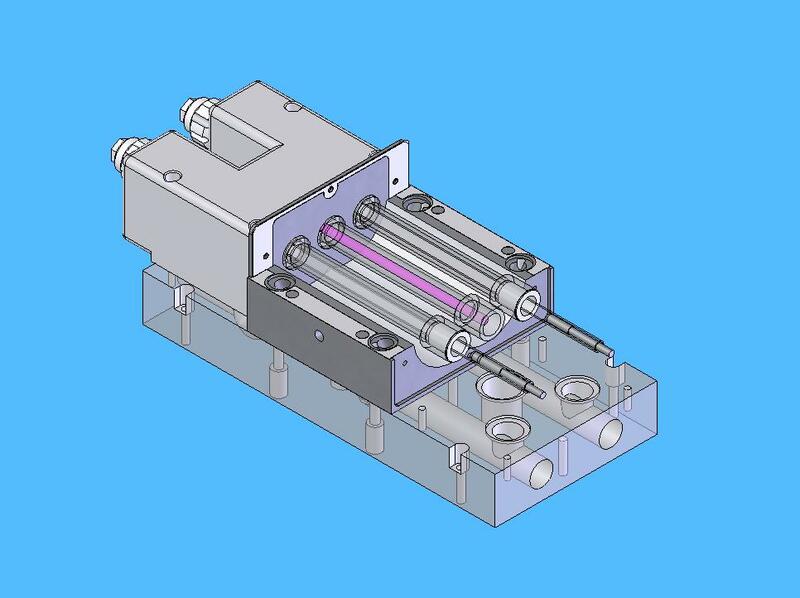 The fiber coupler is just a ZnSe lens with a few precision screws to allow the laser to be coupled into a fiber for surgery. This laser takes about 3kW to get it running at full power, so the power supply is fairly massive. The power supply itself uses a SLR topology, and is actually 2 complete power supplies (each consisting of a fullbridge of mosfets, load matching inductor/capacitor, 2 paralleled transformers and a diode rectifier stack) stacked on top of each other, connected in parallel. Unfortunately, I never did figure out how to get the supply running so it has also been mothballed. Also shown is the PFN which has a large capacitor (35ufd/3500v, about 200J), inductor (about 200 turns of #10 flat magnet wire), and a gigantic (~20lbs) trigger transformer with a driver circuit. After I damaged the Ho:YAG rod, I decide to replace it with another Nd:YAG rod I had laying around, that was stolen out of my ssy-1 laser. The rod was slightly too large in diameter (5mm vs 4mm). and too short (65 vs 76mm), but with a little hackery I managed to make it fit, and took a few pictures. I have since replaced it with a proper 4mm x 76mm rod, and reclaimed the 5x65mm rod for my ssy-1. I also moved the passive q-switch from my ssy-1 over to this laser for a while, and running the capacitors are about 50J I was able to get a q-switched pulsed similar to that of an unmodified ssy-1 laser head, at about 10Hz. A shot of the improperly sized yag rod (I ended up just epoxing it into the rod holders which worked surprisingly well), and a mockup of the head with the rod installed. A shot of the laser tightly focused on a razor blade, although I didn't have quite enough power to make it through in one shot, making this laser about a 0.5 Gillette laser. While I had the head taken apart I decided to draw it in SolidWorks, and a zip of the model can be found here; it has a few duplicate parts to deal with the conversion from Ho:YAG to Nd:YAG, just hide/unhide them as necessary.